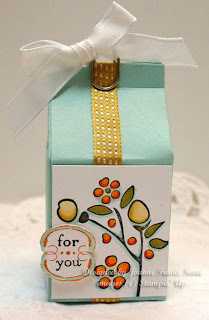 All supplies are Stampin' Up: Pool Party cardstock with the milk carton Bigz die. Bordering on Romance stamp set with Elements of Style for sentiment. Summer Starfruit stitched and white taffeta ribbon. 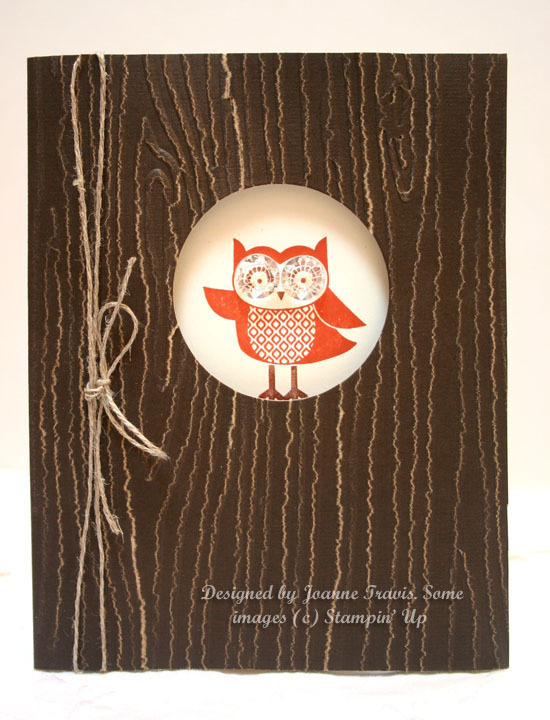 Inspired by a sample in Stampin' Success (demo). Another selection available August 1st from the Stampin' Up holiday mini is this set Affection Collection. 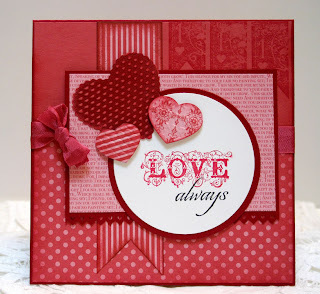 I really love the versatility of this set, great for lots more than just valentines. 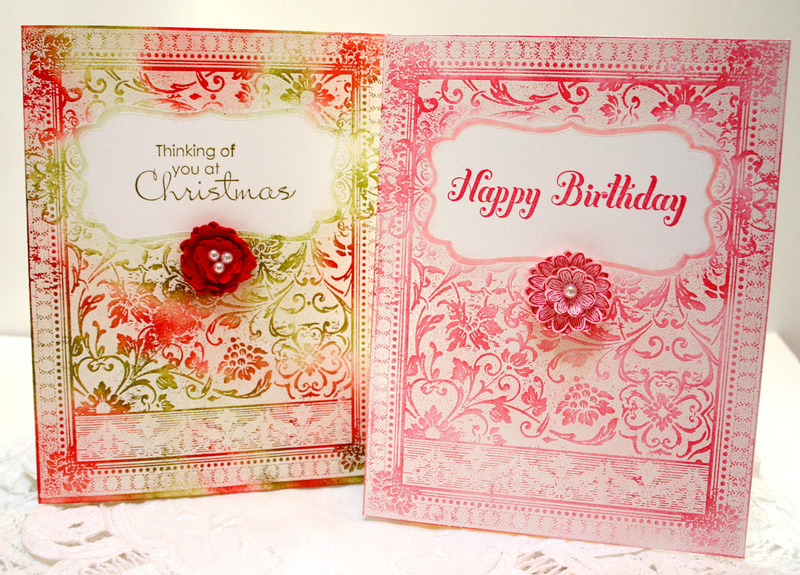 I used the In Color designer series paper with Raspberry Ripple and Primrose Petals cardstocks. Hearts Framelits also used. Mojo Monday 252 sketch. 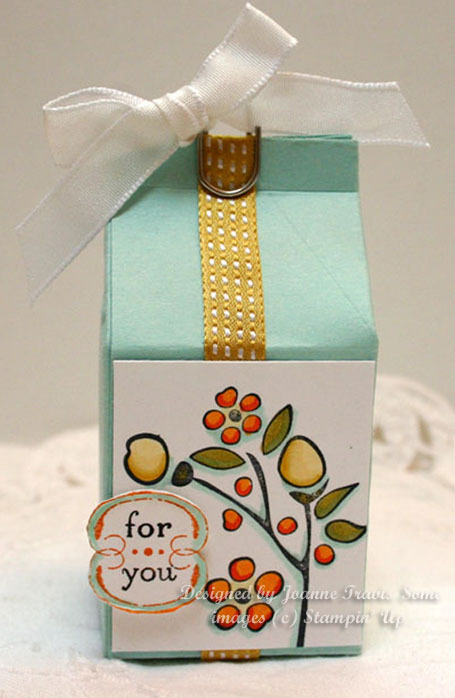 Festival of Prints designer paper, Ornament Keepsakes stamp set, cherry tulle and antique brad, Mojo 251 sketch. All supplies are Stampin' Up. To make the rosette, I wrapped the tulle around a large serving fork about 6 times and tied in the center with some thread. I then cut both ends and trimmed it into a circle and fluffed it up a bit. Added brad with glue dots. I felt in a vintage-y mood today so I used the Apothecary Art and cut it out using the So Grateful sentiment on the banner from the set Take it to Heart. Elements of Style flower cluster cut out and added to side of frame. (Idea from the main idea book.) Coredinations cardstock in Cherry. Not sure why this didn't sand off as white inside as the Espresso? 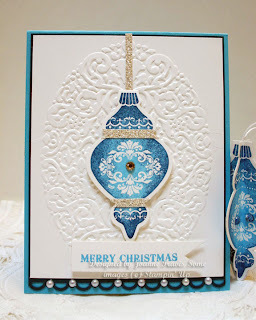 The embossing folder is by Sizzix, it says Stampin' Up on it but I didn't see it in the catalog so I don't know if it is one we carry and it did not have a name for the design on it. Added some Dazzling Details to the flowers for a little extra wow. 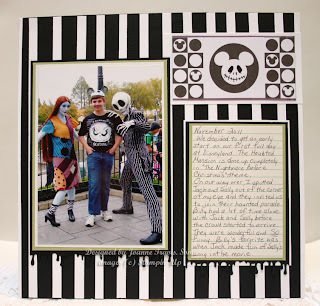 A fun memory and our favorite of our trip to Disneyland last November, meeting Jack Skellington and Sally, and the eight times we went in the Haunted Mansion :) Page size is 8x8. Here are some more fun items available August 1 from Stampin' Up. 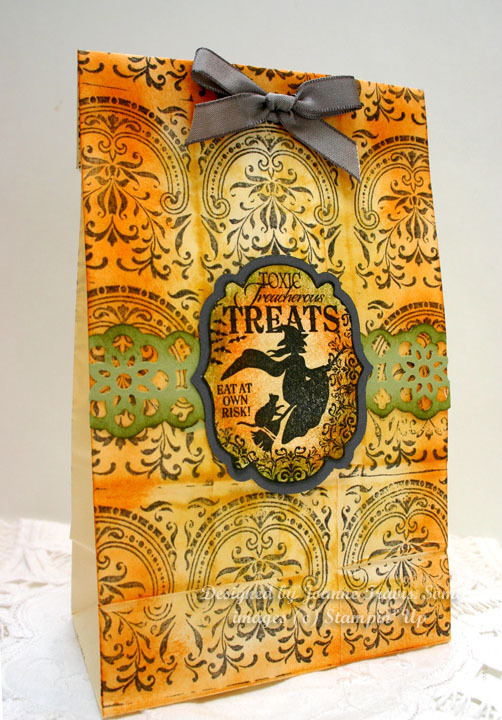 The Halloween set is called Toxic Treats and it coordinates with the label punch and the Labels Framelits dies. The background is a jumbo wheel (in Basic Gray) called Etruscan Elegance. Love this! I used the SU border punch in Olive, craft paper bag is non SU and was inked in Pumpkin and Saffron and tied with Basic Gray taffeta ribbon. From the Stampin' Up holiday mini I used the new oval frame embossing folder, the Ornament Keepsakes stamp set and matching Framelits dies. Colors were Tempting Turquoise, rolled edges in Not Quite Navy. 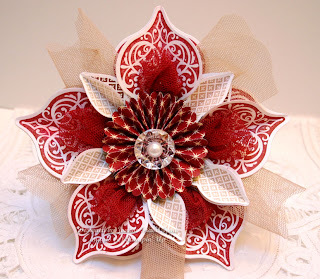 Silver glitter paper to accent with half pearls and rhinestones. I made a matching ornament by cutting 4 ornaments, scoring in half and adhering all together with some white twine for hanging. 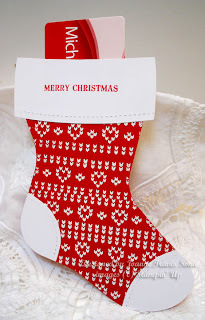 Christmas sentiment is from Owl Occasions. 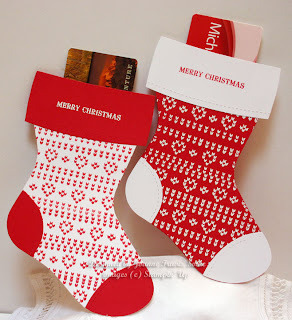 Stocking die gift card holders in Real Red and Whisper White with Nicely Knit wheel (new Stampin' Up Holiday mini)in embossed white and Versamark, the other just in Real Red. Cut two of each color stocking to get the coordinating heel, toe, and cuff pieces. 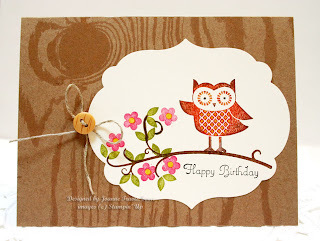 The sentiment is from Owl Occasions (new SU). Stampin' Up goodies: Owl Occasions stamp set with flower and sentiment from Create A Cupcake, Natural Composition specialty cardstock, naturals button and linen thread. All new Stampin' Up: Owl Occasions stamp set, Woodgrain embossing folder, Coredinations cardstock. Embellished with linen thread and facet buttons on owl eyes. The ornament on the cover of the new Stampin' Up Holiday mini totally sold me on this new ornament stamp and dies set. I cased it, adding a few very small changes, theirs is so much prettier. I'll have to keep practicing. Another really cool product is the tulle ribbon. It is 3" wide and comes in Cherry, Crumb, and Espresso. Love. More new stuff! 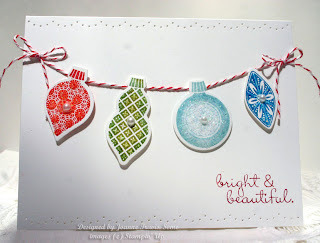 I love the new paper pack from the Holiday mini called Festival of Prints. There are 48 sheets of 4"x 6" papers, four of each design. 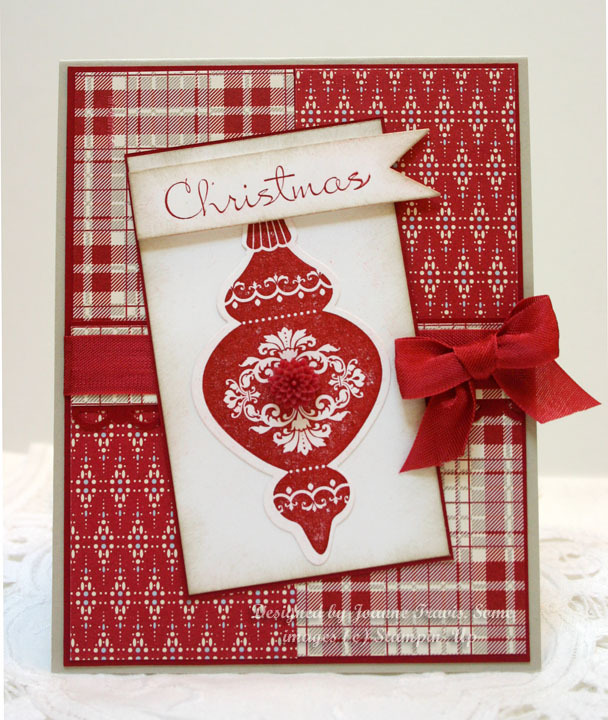 This is perfect for cardmaking and offers more variety in the patterns. Love it! I used this week's Mojo 248 sketch and the new Ornament Keepsakes set with the coordinating framelits die. 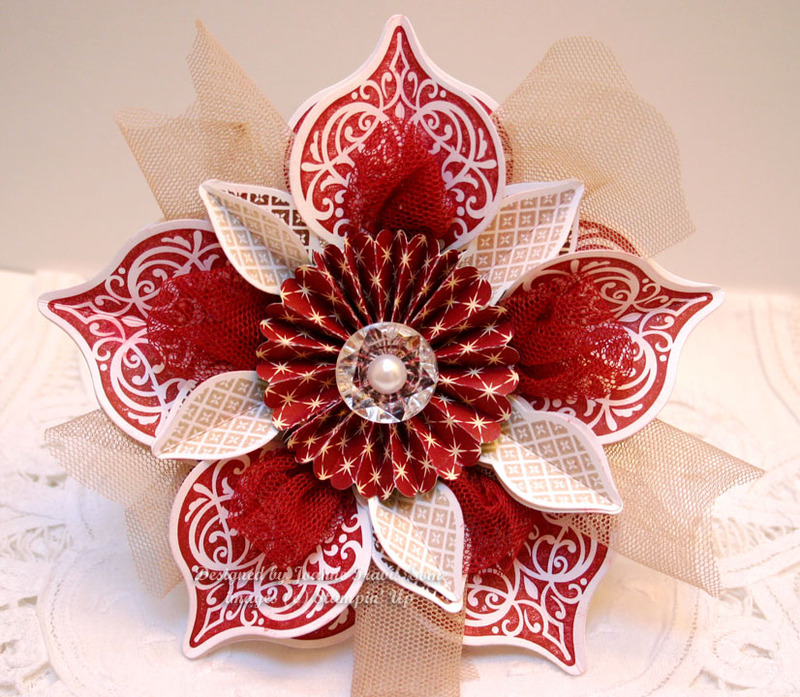 Cherry Cobbler and Sahara Sand cardstocks, cherry seam binding ribbon, and dahlia button to embellish. 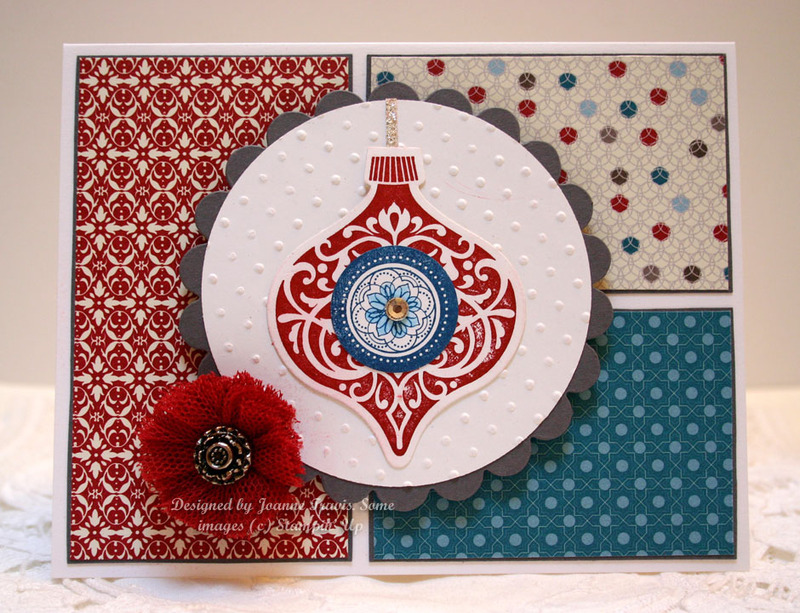 My favorite selection from the new Holiday mini is the set of 9 Ornament Keepsakes stamps that comes with a matching set of 8 Framelits dies. You can purchase them in a bundle to save some money. 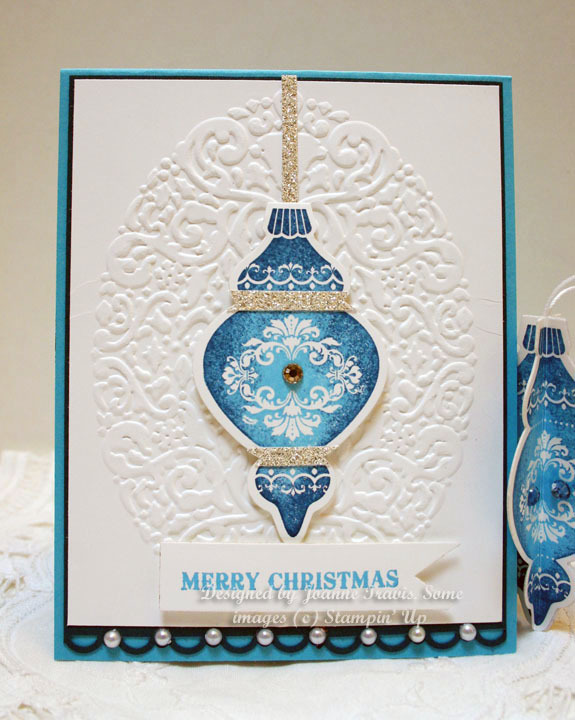 I cased the sample in the catalog and added some pearls and Dazzling Details glitter to each ornament. The upcoming Holiday mini will be available on August 1. 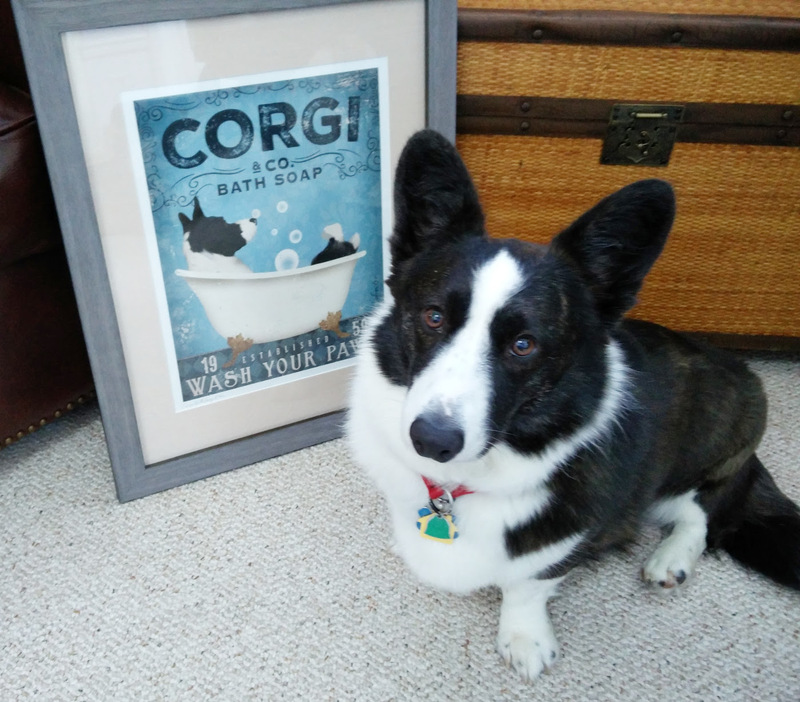 Wait until you see all of the beautiful things, it's my favorite mini catalog in years! 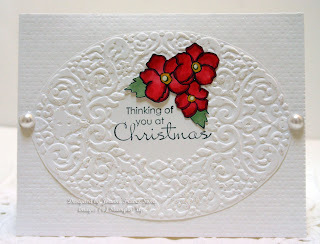 For this card I used the new embossing folder Holiday Frame. I cut it out around the oval and added some Dazzling Diamonds on top. The flower is from Bordering On Romance and the sentiment is from Beautiful Season. Whisper White base. Love this new background stamp from SU. 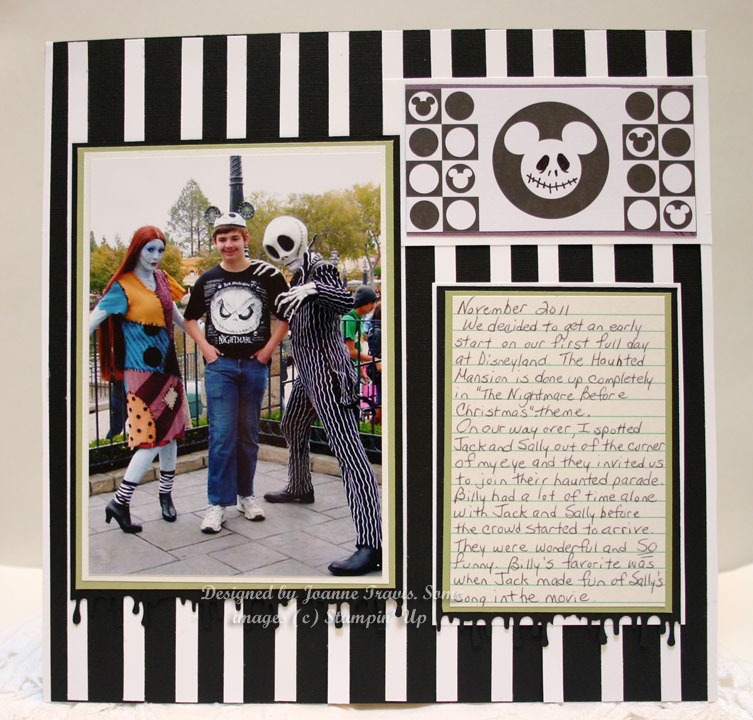 I made one layer cards out of Whisper White and embossed with white powder. For the birthday card I sponged on Regal Rose and the sentiment is from Bring on the Cake, the flower is from Punch Potpourri. The same exact design was used for the Christmas one using Old Olive and Poppy Parade. Sentiment from Beautiful Season (current). I am enjoying the new Four Seasons SU hostess set. 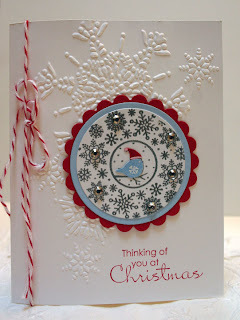 This is the winter stamp, I embossed it in silver and added ome rhinestones on the snowflakes. Paper pieced the bird in red and bashful blue for a pop of color. The whisper white card base is embossed with the Northern Flurry folder and red bakers twine to embellish. Sentiment is from a Beautiful Season (current).